Today we rode into the slums. Take that in for a moment. If you have been born and bred in the United States or any other developing country it’s likely you have never seen poverty like we witnessed today. There were people at every turn, some running around in the mud without any shoes. Trash was everywhere. It almost looked like a sparse landfill. There were no paved roads at all, just blackened muddy paths with huge ruts throughout. The paths were so muddied we had to ride in in Land Cruisers to get through. People were lined up selling everything from clearly worn shirts to mangos. And while the poverty was palpable, there was still an air of simplicity, energy, and community throughout; that even though these people lived in sheer poverty, their spirits had not been broken. We went into a slum to visit a primary school that is being funded by USAID. The children were incredibly bright and clearly eager to learn as if they understood that education is their only way out of the slums one day. They took to their lessons with an air of determination that I have never seen in my life from children. Seeing their lessons in progress I was astounded. Everyone sat in their wooden benches, each one wearing worn and ragged clothes, but that didn’t matter. Their attention wasn’t on what they didn’t have. Rather it was solely focused on the lesson at hand. They read sentences from the board in unision. And when the teacher called upon a student to come to the front of the class to perform a task, the teacher praised their work when done and their classmates clapped for their success. It was beautiful. I was enthralled by the extremes — poverty and brilliance — all in one room. It will stay with me forever. I wish I had the chance to meet you personally at the One dinner in Nairobi, but there were so many people, and you were all whisked away so quickly! I am glad that you were able to visit Mukuru, and see the conditions there, and the need for education services in these communities. 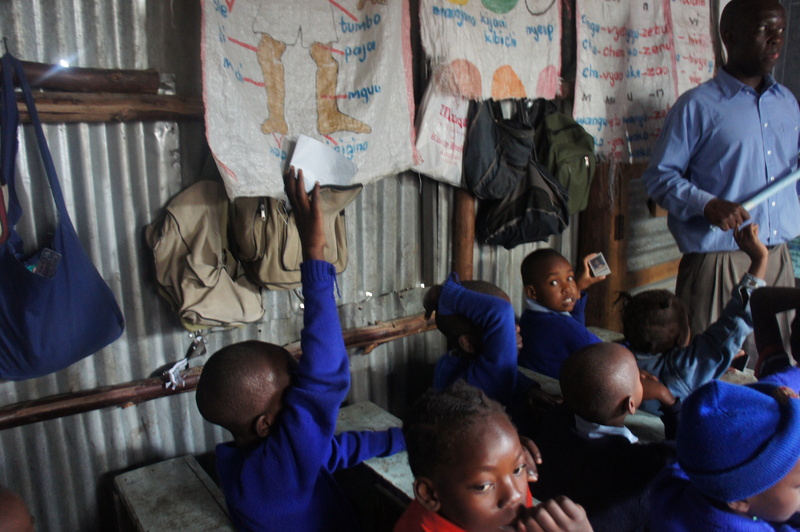 Mukuru is an area where Bridge International Academies operates 8 primary schools to ensure that parents can afford high-quality, affordable education for their children–for less than $4 per month (or 320 Ksh). I hope you’ll check out what we’re doing on http://www.bridgeinternationalacademies.com, and get in touch with any questions!